We’ve made a lot of mini mason jar dessert recipes over the years, and they are each extraordinary in their own right. 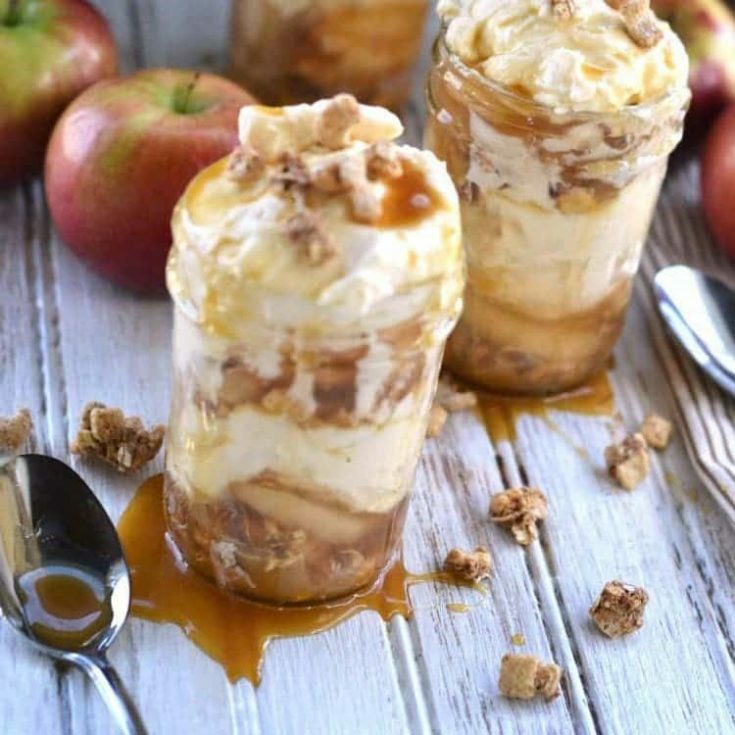 This Apple Caramel Cheesecake Parfait recipe is a pure delight. I mean–cheesecake! Need I say more? When you put together things like cheesecake and apple pie, you get a result that is entirely awe inspiring. One thing I really love about this recipe it that it is a quick easy no bake dessert. No bake desserts are where it is at! Like our No Bake Pumpkin Cheesecake, No Bake Chocolate Drop Cookies, and Banana Cream Dessert. Easy no bake dessert recipes are a great thing to have on hand for busy days when you want to serve something special, but don’t have a lot of time to invest in the kitchen. I buy mason jars online, so I happen to have a lot of them sitting around, especially if I’ve had a slow canning season like this year, so I like to use them for serving desserts. They just look cuter that way! You can make the Apple Caramel Cheesecake Parfaits ahead and refrigerate. I especially love plastic jar lids for this reason. Unfortunately, I’m constantly loosing lids–the house seems to eat them–so that’s on my list to stock up on soon. When we’re able to take a few ingredients, mix them together and/or layer them, and make an extraordinary delicious dessert–well, that is the perfect day for me. And if it’s a messy dessert…even better! What’s your favorite mason jar cheesecake recipe? Like I said before, making desserts in mason jars is a fun. It’s a great way to make it look like you took a lot of time to prepare those cheap easy no bake desserts. Just because you take a short cut or two in the kitchen doesn’t mean you can’t pretend it took forever! Or that your dessert can’t look more extravagant than the cost really was. Super Easy No Bake Desserts: Mason Jar Cheesecake Recipe a Winner! Personally, I could eat one of these mason jar dessert recipes every day of my life. Of course, I don’t…but the point is that I could. Easy desserts. Good desserts. Super tasty desserts. Love Mason Jar Desserts? So do we! This Apple Pie Caramel Cheesecake Parfait Recipe is so easy to make. We love sharing easy no bake dessert recipes! In a mixer mix heavy cream, sugar, cinnamon,and cream cheese. On high speed for 1-2 minutes or until a peak forms. In mason jars, place granola covering the bottom, top with caramel, a scoop of apple pie filling, followed by cheesecake filling. Top with granola and caramel. Repeat until your dish is full. Serve! Wow.. these look amazing! In fact, I love it so much I’ve chosen your post to be featured at this week’s You’re Gonna Love It Party ! Thanks for linking up! What a yummy looking dessert! Love caramel & apples together. Thanks for linking up to Merry Monday! Sharing on MM Pin board! Have a great week! I already have plans to make this luscious looking dessert! My teenage son wants dessert every night but I can’t bake everyday. This is a perfect solution and we all love apple and caramel. Your Jar Dessert looks fabulous! Hope you have a very special week and thanks so much for sharing with Full Plate Thursday. This looks divine and I’m happy to know that my house isn’t the only one playing hide and seek with the lids! We would love for you to share this at Celebrate Your Story Link Party. The party goes live every Monday at 8pm. Here’s the link for this week’s party and we hope that you can join us. Thank you for bringing your reciipe to Blogger’s Pit Stop. I love caramel apples, so I’m sure I’d love this. Just what Iwas going to ask Gugu. I guess it is layered with cheesecake mix. I want to know what size jars are pictured. They look small. I can’t believe a whole can of apple pie filling only makes 4 small jars though. No instruction as to what to do with Apple filling? This has been corrected. Basically you’re layering in in with the other ingredients. Easy and delicious! This looks delicious! Just wondering if the apple pie filling is mixed in with the cream cheese or do I layer it with the caramel and granola? It is layered, not mixed in. I’ve made these and they are amazing. I put them in 5oz cups and made them for a big party of 200. Everyone loved them! Wow! That sounds amazing and what a huge party! I’m glad they were such a success. Love this! How many servings is this recipe and what is the serving size? I would make them in 1/2 to 3/4 cup serving sizes. The portions we used for the photos are a little bigger. Hello! These look amazing! Want to try for a wedding dessert table. How many servings does this make? I would make them in 1/2 to 3/4 cup serving sizes. The portions we used for the photos are a little bigger. For a wedding, I would definitely use smaller jars or dessert serving dishes and make them about 1/2-3/4 cups in size. Okay thank you! I’m using 3 oz dessert shooter cups. Do you know how many ounces this recipe makes? I believe roughly 60 ounces, just by calculating the ounces in the ingredients. Will this work with 4oz mason jars? And how many servings is this recipe and what size jars did you use in the photos? It would. Servings depend on the size of the jars. I believe the jars used were 8 ounce jelly jars. Looks so yummy! How many servings are in one recipe? It depends on the size jars or dish that you use. I’m interested in serving at a family game night. How many jars does this recipe make?